1. The Watch Works With Android 4.3 Or Higher, IOS 7.0 Or Higher. 2. For Android Phone It Supports All Functions. Scanning the QuickResp Code On Watch Menu to Download The APP "Funrun". 3. Because Of No APP Available For iPhone, So Five Functions Can't Be Used (Anti-lost,Messaging,Notifier,Remote Camera,Bluetooth music). Other Functions Can Be Used Normally Because No need The APP. 5. The Watch Is Only Daily Water Resistant, Not For Showering Or Swimming. Audio Player: Play Local Music Or From Smart Phone Connected Via Bluetooth. Facebook, Twitter, WhatsApp, Browser: Require SIM Card Which Is Available For Internet. SIM Tool: The Watch Could Be A Standalone Phone With SIM Card Inserted(Not Included). 【 SATISFACTION GUARANTEED】: 100% Satisfaction Guarantee, Free return within 90 days. If you are not 100% satisfied with this smart watch, we will replace it for you or simply return it for a full refund no questions asked. 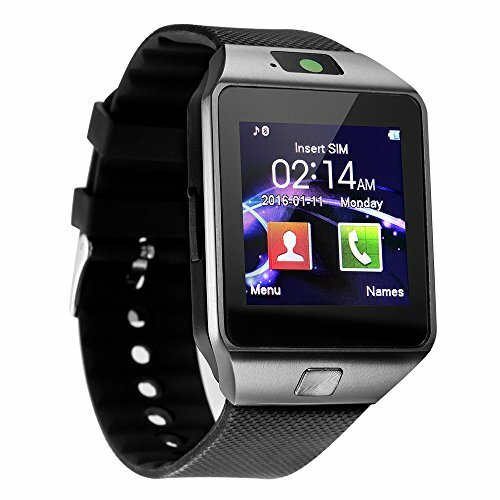 This smart watch is suitable to any age people as surprise gift. If you have any question, please feel free contact us! We will solve for you! If you have any questions about this product by HTUT, contact us by completing and submitting the form below. If you are looking for a specif part number, please include it with your message.